If you love big, plump, roasted-till-they’re-gold-and-crunchy cashews and you’re on a sugar free diet, that’s wonderful; cashews are incredibly good for you and will fit right into your diet plan. But if you also love the rich, sweet taste of chocolate, that presents a problem since much of the appeal in chocolate comes from the heavy load of sugar that it contains. That’s where we come in. The good news is that you don’t have to deprive yourself of the joy of chocolate. The better news is that with our luscious Sugar Free Chocolate Covered Cashews, you get all the sweet flavor but none of the sugar. Just look at the big, beautiful chocolaty cashews you get from Superior Nut Store! It’s easy to see, there’s no comparison to the hard, drab-tasting store-bought midgets you’ve tried once, and once only. These are the same premium gourmet cashews we sell to connoisseurs all over the world, only now they’re drenched in our sinfully sweet—but sugar free—milk chocolate. Freshly roasted on-site, wonderfully creamy and crunchy all at once, they’ll satisfy your primal urge for chocolate without touching off the alarm on the guilt meter. Say it with us: finally, a sugar free chocolate that tastes the way chocolate should. While your taste buds are reveling in the sweet essence of the milk chocolate coating, don’t forget what’s contained in the crunchy interior: a powerhouse nut with a long list of beneficial elements that contribute to your good health. Premium cashews like these are an important source of magnesium and iron, plus many other important nutrients, as carry a big dose of natural plant protein to boot. So why not indulge in a delicious, nutty, chocolaty snack whenever you feel the urge? 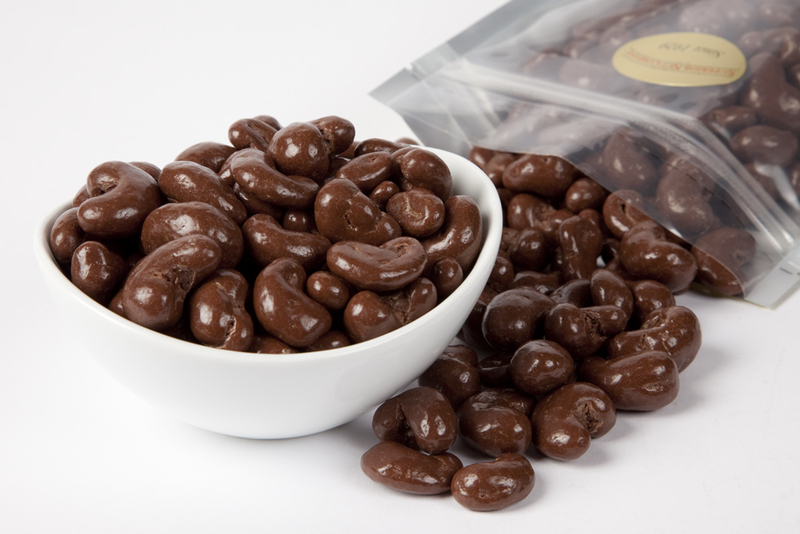 With our sugar free chocolate covered cashews, you can fully enjoy every wonderful bite! Sugar Free Flavored Chocolate (Chocolate Liquor, Maltitol, Cocoa Butter, Sodium Caseinate, Milk Fat, Soy Lecithin (an emulsifier), Artificial Flavor (Vanillin), Natural Flavor, and Salt), Cashews, Gum Arabic, and Certified Confectioners Glaze. Contains: Cashew, Milk, and Soy Ingredients. This product may also contain trace amounts of peanuts and other tree nuts. I was excited to find sugar free chocolate covered cashews. I must watch my sugar and carbohydrate intake and this gives me a chance to enjoy a special treat without the guilt. I like the cashews and they were delivered very fast which I loved. ProsCashews were big and covered with chocolate. These were excellent, The chocolate didnâ€™t taste sugar free and the nuts were excellent as usual. I was impressed.